Together with the addition of two new hatchback models to the Chevrolet Cruze range comes a realignment of the 5-car sedan range. The 1,6 litre petrol engine receives a power boost to 91 kW while the 2,0 litre diesel engine has its power increased from 110 kW to 120 kW together with 360 Nm of torque, up from 320Nm. Drive for the 2,0 litre diesel models is now via a 6-speed manual transmission for the LS version and 6-speed auto transmission for the LT version. Styling and comfort enhancements include a headlamp levelling system; steering wheel mounted satellite controls for the audio system; Cruise Control; a revised 16” alloy wheel design; and re-styled front and rear bumpers. These changes apply to the Cruze 1.6 model. Further up the range items such as Bluetooth – Music Streaming; a height adjustable passenger seat; Electronic Stability Programme and Traction Control are added. The realigned Chevrolet Cruze sedan range consists of five models. Three of those are petrol powered variants with a choice of Cruze 1.6; Cruze 1.6LS; and Cruze 1.8LS. Two diesel powered models are now offered with a choice of Cruze 2.0LS with 6-speed manual transmission, or top specification Cruze 2.0LT with 6-speed automatic transmission. The 1.6 litre engine is a latest generation unit from GM with a twin-camshaft, 16-valve architecture and variable valve timing on both inlet and exhaust sides. In its latest form a variable volume intake manifold and revised engine control calibration provide an increase in power from 80 kW @ 6400r/min to 91 kW. Maximum torque is 155 Nm @ 4200 r/min. The 1.8 litre engine shares the twin-cam, 16-valve VVT architecture of the 1.6 litre engine. This unit produces 104 kW @ 6200 r/min and with 176 Nm of torque at 3800 r/min. Power is delivered via a 5-speed manual transmission. 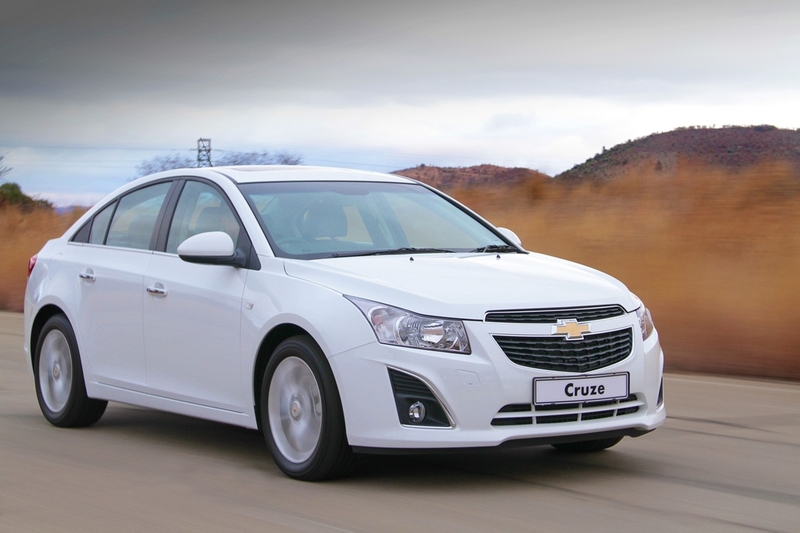 Significantly the Cruze 2.0D LT delivers these numbers together with exceptional fuel economy. In tests conducted by GM development engineers, fuel consumption below 6l/100 km for the combined cycle has been recorded. Low emissions are also a feature of this engine with just 150 gm per kilometre of CO2 produced in normal driving conditions. Driver, passenger front airbags and side airbags. Factory fitted options include: Jet Black leather seats; Climate Control aircon (part of Driver’s Package); and Rear Park Assist (part of Driver’s Package). The Chevrolet Cruze is covered by a five year/120 000 kilometre warranty with a five year unlimited anti-corrosion warranty. Service intervals are 15 000 kilometres. A three year/60 000 kilometre Service Plan is included in the purchase price.